Using a simple Word Ribbon, SME’s and Reviewers can review and edit content without requiring a software license. When complete, the administrator can run a batch update back to the Content Portfolio. This document can then be edited and formatted using all of Microsoft Word Features, including Track Changes. The Content Management Report includes its own Expedience Ribbon that can be used by the SMEs and Reviewers. 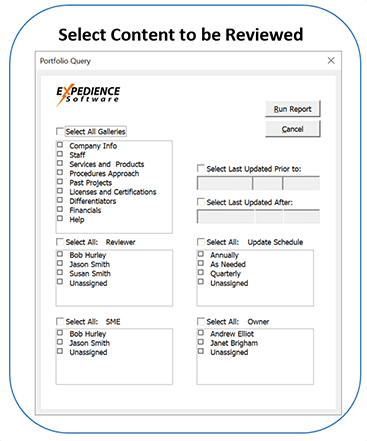 Content can be flagged indicating whether the content has been changed, reviewed and approved by the content manager and then seamlessly updated back to the Content Portfolio –all within Microsoft Word.